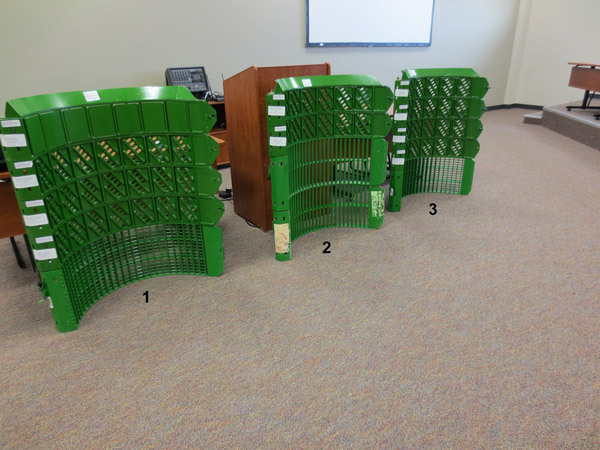 Sunnybrook Welding half size concaves are compatible with full size John Deere concaves (shown at floor level on all three displays). 1. Setup for Pre Bullet STS JD machines to harvest hard threshing crops such as Hard Spring Wheat & Durum. 2. Setup for easy threshing crops for JD machines like Peas/Barley & Canola. 3. Setup for hard threshing crops for JD machines with Bullet Rotors.